Vatican archbishop: Buon giorno Philadelphia! 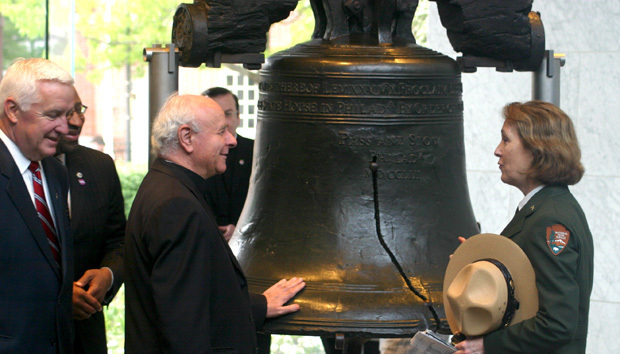 The archbishop in charge of the Vatican office sponsoring next year’s World Meeting of Families in Philadelphia paid a visit to the city May 13 in typical tourist fashion: by viewing the Liberty Bell and Independence Hall. Archbishop Vincenzo Paglia, president of the Pontifical Council for the Family, was joined by Archbishop Charles Chaput and the event cochairmen, Gov. Tom Corbett and Philadelphia Mayor Michael Nutter, for the morning review at the Liberty Bell pavilion, then on to a private tour of Independence Hall led by National Park Service guides. He said Pope Francis’ compassion for the needs of people around the world “and his deep care for the institution of the family” were the inspiration for the theme. Archbishop Chaput reiterated, as he has in the past, that he does not expect the pope to announce whether he will come to Philadelphia next year until about March. But he said that the World Meeting of Families is planning as though the pope will attend. 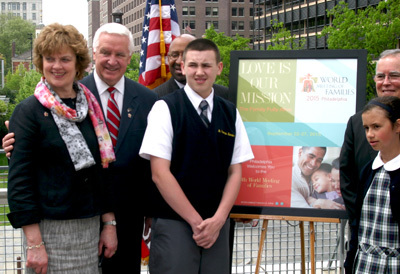 Unveiling the theme of the World Meeting of Families, “Our Mission is Love: The Family Fully Alive,” are from left Susan Corbett and her husband Gov. Corbett, Mayor Nutter, Christopher Bannon and his sister Isabella Fontanez, and Archbishop Chaput. Pope Francis appears to be involved in details of the planning even at this point. The archbishop said the theme was developed through consultation here and with officials of the Pontifical Council for the Family in Rome. Two suggested themes were presented to the pope and he chose the one announced at the press conference. It will form the basis of preparatory teaching and programming content for the World Meeting of Families, at which about 100 speakers are expected to participate in the international conference, along with thousands of attendees from more than 150 nations. 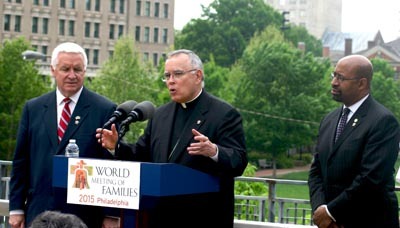 Archbishop Charles Chaput speaks at a press conference May 13 at the Independence Visitors Center attended by the co-chairs of the World Meeting of Families in Philadelphia, Pa. Gov. Tom Corbett (left) and Philadelphia Mayor Michael Nutter. Archbishop Paglia, who had met Archbishop Chaput, Gov. Corbett and Mayor Nutter and the Philadelphia delegation during their trip to Rome in March, appeared to thoroughly enjoy his whirlwind tour. Asking questions of guides to the historic sites and speaking better-than-adequate English, the Italian archbishop said May 13 is the feast of Our Lady of Fatima on the church calendar. It was also the day in 1981 when Pope John Paul II, now a saint, founded the Pontifical Council for the Family. He would have announced the news but was wounded by an assassin that same day. Regarding the World Meeting of Families itself, no new details were revealed except that “every inch of the (Pennsylvania) Convention Center has been booked,” Archbishop Chaput said. He, Corbett and Nutter said they expect plans to be firmly in place by this September, including a budget for which fundraising continues. 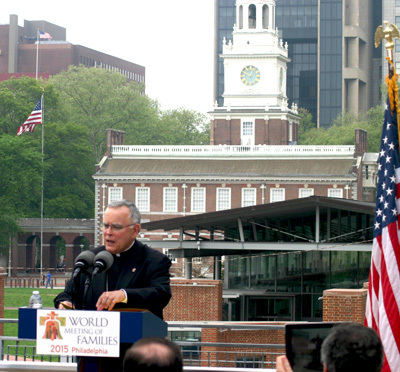 Archbishop Chaput answers questions during a press conference May 13 at the Independence Visitors Center, with Philadelphia’s Independence Hall in the background. Archbishop Chaput said funds will be raised to help poor families attend the meeting and to help them materially, after meeting expenses for the meeting’s events, in the months and years to follow. Getting people to the events from hotels in the city and surrounding counties will be a logistical challenge. Corbett said the planning team is looking at smaller yet significant recent events in the region such as last year’s U.S. Open at Merion and the Republican National Convention in 2000. He suggested World Meeting of Families attendees might come from hotels as far perhaps as Berks County. Once participants arrive they will find programming for all types of families, including “non-traditional families,” Archbishop Chaput said in response to the issue of families headed by homosexual couples. “Everybody is welcome,” he said, adding that although the meeting will “primarily involve a Catholic understanding of the family,” the virtues of the family are the same: “love, fidelity and support in time of need,” he said. The morning press conference also included Philadelphia’s Ukrainian Catholic Archbishop Stephan Soroka and students of St. Francis Xavier School in Philadelphia, brother and sister Christopher Bannon and Isabella Fontanez. Afterward Archbishop Paglia and aides from his congregation traveled from the historic district to the Benjamin Franklin Parkway and tours of the Cathedral Basilica of SS. Peter and Paul and the Philadelphia Museum of Art. The wide stretch of the parkway offered the archbishop a view of what Pope Francis might expect to see if he comes to celebrate a Mass in Philadelphia. Mayor Nutter called the area the most likely place to host the Mass. After walking through the cathedral with the rector, Msgr. Arthur Rodgers, the entourage of the two archbishops, Gov. Corbett and his wife Susan walked across 18th Street to the Sister Cities Plaza and an impromptu cup of Philadelphia water ice from a street vendor – who might want to prepare a lot more for September 2015. At the press conference are, from left, Philadelphia Ukrainian Catholic Archbishop Stefan Soroka, Gov. Corbett, World Meeting of Families Executive Director Donna Farrell, Archbishop Chaput and Archbishop Paglia.